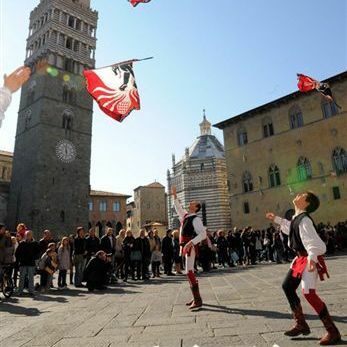 Yesterday, October 7th, saw the conclusion of the second edition of an event destined to grow, thanks to the exceptional enthusiasm and interest it fetches for tourism in Tuscany and in Italy: the Festival of Medieval Tourism (FTM) of Pistoia. 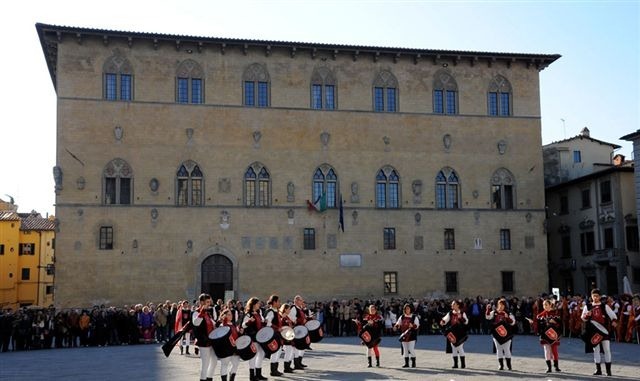 An event that involves the most representative towns of medieval Tuscany and Italy, thanks to the authorities of those places, who investing in the care and preservation of ancient structures, have made the medieval features a milestone for the development of tourism. A Festival of Medieval Tourism that involves both Italian and foreign tour operators, and personally us of Tuscany Holiday Rent, constantly looking for new ideas and inspirations to enthral the foreign tourist and introduce him or her to other realties of our region besides the greater ones of Florence, Pistoia, Siena, Arezzo, Lucca, Pisa, San Gimignano etc., such as those wonderful pearls which in one way or the other are the heart of medieval Tuscany and the greatness of this territory. A mention to Serravalle Pistoiese, a small village on the border between the seaward plain and the hills of Pistoia and Florence, whose magnificent towers, of which the tallest recently restored and accessible to the public, looks over a wide-ranging landscape, which stretches as far as the eye can see, giving the inquisitive spectator a complete vision of much of the northern part of Tuscany. Mentions also go to Certaldo, a tiny fortified village, birthplace of Italian humanist Boccaccio, and Pescia, a charming town with medieval origins. And here we stop, not to be disrespectful to all the medieval landmarks in Tuscany, but because this article such wants to remain, so as not to dwell too much and bore the reader. 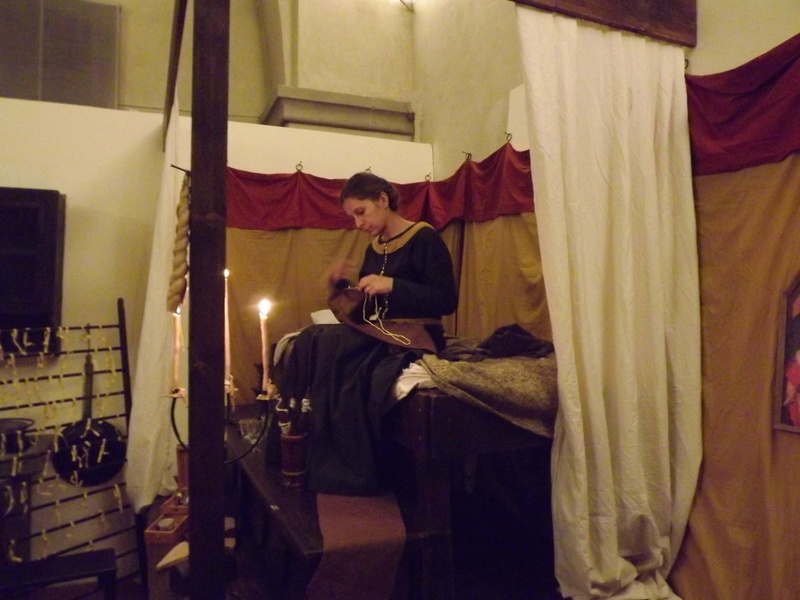 This is a Festival of Medieval Tourism that involves numerous public visitors, offering valuable information, often little known and hardly disclosed to sightseers, and represents traditional medieval performances. Furthermore, thanks to the precious collaboration of a group of passionate medieval authenticity scholars, the Sestiere Castellare group, the Festival also offers a small glimpse of life as it was in the Middle Ages, from wax making, textiles, tools and delicious dishes, with the conditions and especially operating time typical of that period, oblivious to the haste of our age. Among the many interesting organizations, we also cite C.E.R.S. 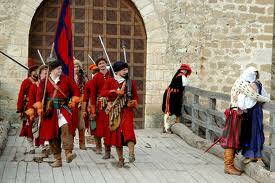 (Consorzio Europeo di Rievocazioni Storiche), the European Society of Historical Re-enactments which is engaged in recreating past events. Not only Tuscany. 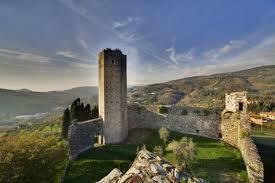 The Festival of Medieval Tourism, as mentioned, involves all the medieval circumstances on the Italian territory. This year’s edition saw the presence from Piedmont of Cremolino, Cassine and Incisa Scapaccino, from the Aosta Valley the town of Saint Denis, from Trentino those of Lasino and Trento, from Liguria the town of Zuccarello and from Emilia-Romagna those of Verrucchio, San Leo and Casteldelci. These are all resorts which a lover of the Middle Ages cannot fail to visit, and even stay in order to fully plunge in this enchanting atmosphere, almost unaltered in time. 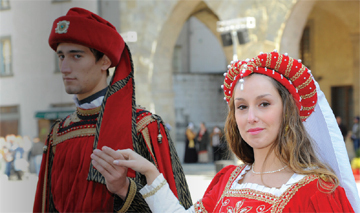 Compared to the preceding edition, this year the Festival of Medieval Tourism, has increased the number of attendants. In short, it is expanding and, with greater perseverance, is uniting our beautiful medieval locations, thanks to this brilliant initiative that converges all enthusiasts and leads them to have a single point of reference. 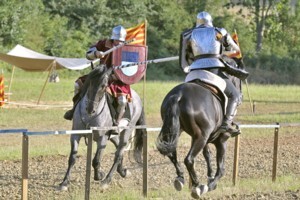 Furthermore, this year’s presence of the organizers of “Times and Epochs”, a extremely large medieval festival held in Moscow, Russia, is a strong signal and incentive in pursuing this path and bring Pistoia’s Festival of Medieval Tourism to become a worthy Italian example in the context of similar events already present abroad. Tuscany Holiday Rent attended also this year’s edition as buyers, as always drawing inspiration, finding new ideas and reference points for our clients. With all due respect our thanks to the Musiké organization, who had this idea, and to the great professionalism show by its operators, both from the technical and human side, and the friendship they are able to lavish on all those who actively participate in the event, starting from us tour operators, to the representatives of the medieval towns, and to all the medieval history and culture enthusiasts who introduced their activities on the spot. Questa voce è stata pubblicata in Culture and accommodations in Tuscany, Festivals and feasts in Tuscany e contrassegnata con Festival of Medieval Tourism, Medieval city, Pistoia, Tuscany Holiday. Contrassegna il permalink.